Observation - Woody nightshade Westen heights Dover - UK and Ireland. Description: Striking bright red berries with long ovate leaves. Found in lime rich soils growing to a height of 1.5 metres. 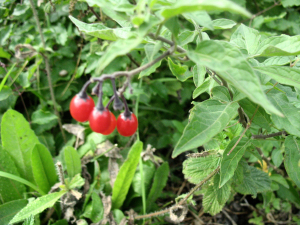 Striking bright red berries with long ovate leaves. Found in lime rich soils growing to a height of 1.5 metres.